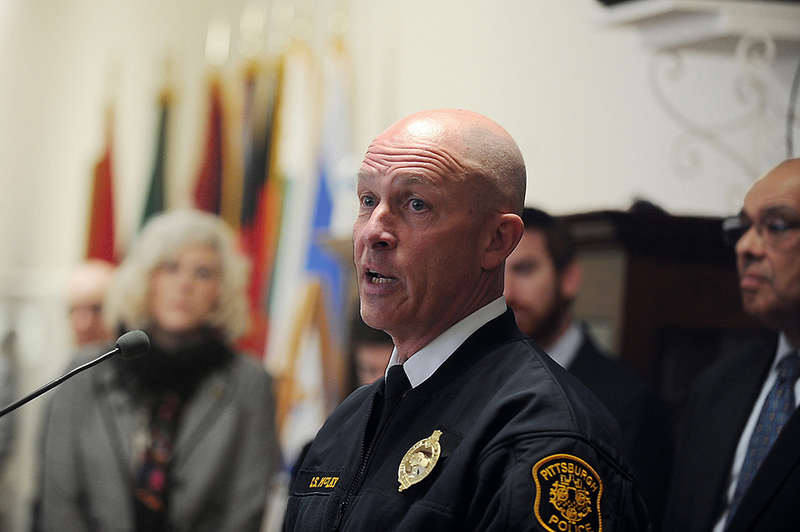 After taking the stage in a prime-time speaking slot at the Democratic National Convention, Pittsburgh Police Chief Cameron McLay said he was giving no political endorsement. It was simply a chance to talk about police reform on a national stage, he said, even if some officers, including the bureau’s union president, saw it as an ethical violation. After controversial fatal shootings by police of black men in Minnesota and Louisiana and the subsequent killing of eight officers in the aftermath, McLay said he’s seen increased polarization between police and critical residents. McLay’s text hits on themes he’s addressed before and acknowledges distrust many residents feel toward police. As a police officer that has served for more than 30 years, let me say this: We can respect and support our police officers while also pushing for important reforms. We can and must do both. Meanwhile, Robert Swartzwelder, president of the Fraternal Order of Police Fort Pitt Lodge 1, said he saw the speech as effectively endorsing Hillary Clinton, who last night became the Democratic Party’s official nominee for president. Indeed, Democratic speechwriters saw McLay’s words beforehand and shortened them to fit a 480-word limit, McLay said. However, he said the words were all his own. His expenses (a flight and one night in a hotel) were also paid. Last night, the FOP’s official twitter had blunt criticism. City code does prohibit officers from campaigning for candidates while on duty or in uniform. "Anyone who believes in any way, shape or form that the DNC is not a political campaign is an idiot," Swartzwelder said, according to the Pittsburgh Post-Gazette. McLay, however, said he was not acting politically and that any officer could speak publicly exactly as he did after receiving his permission. Officers would only run afoul of regulations, McLay said, if they did not seek prior approval. Both Pittsburgh Mayor Bill Peduto and Public Safety Director Wendell Hissrich supported McLay’s decision to talk, he said. The chief said he received positive feedback last night and became aware of grumblings from officers this morning. Kevin Acklin, the mayor’s chief of staff, said there was no violation of city code. It’s worth noting that while McLay did not appear at the Republican National Convention in Cleveland last week, he also wasn’t asked.